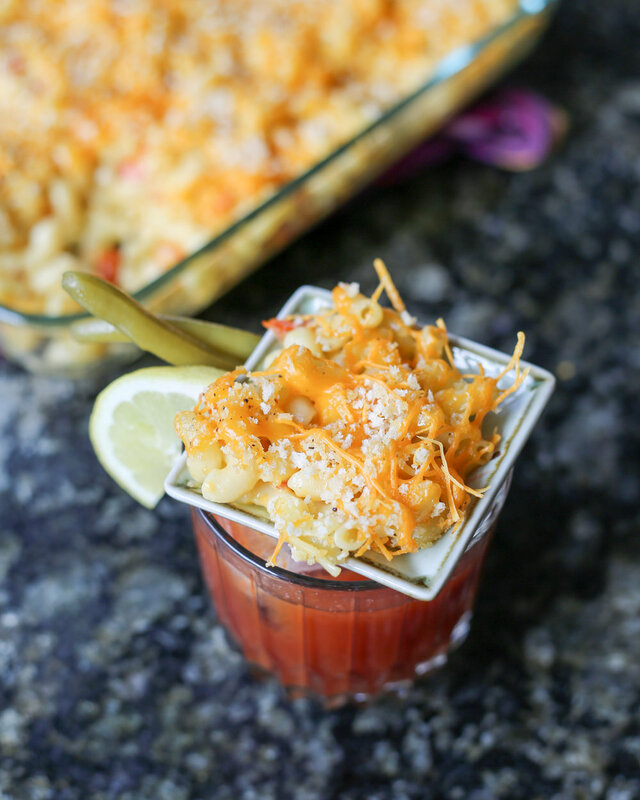 This week, we're teaming up with Cheeses of France to bring you a new bloody mary garnish recipe: Mimolette Mac n Cheese! For almost six years, I've been drinking bloody marys for a living. I like to say that only my accountant knows how many I've had in the past half decade. But his number would probably still be low. From NYC to San Francisco to London and even Taipei, I've had the pleasure of drinking bloody marys from around the world. But I must admit, it can get tiring. Sometimes the drinks are just uninspiring. Sometimes, they're downright disgusting. Sometimes, the last thing your hangover wrenched stomach needs is a pint glass full of tomato juice. But it's my job. And I take it very seriously. This week, I was happy to try my hand at making a very cool Mimolette Mac n Cheese garnish. The recipe was super simple but absolutely delicious. And it looks very cool sitting atop this crimson cocktail. For the actual drink mix, I had some Smokin' Mary Bloody Mary Mix on hand. This rich and savory smoky mix stands up well to the creamy mac n cheese goodness. Feel free to use whatever you may have available. Place macaroni in a large pot of boiling water with a bit of salt and cook 8-10 minutes or, to desired tenderness. Drain and rinse with warm water. In a saucepan, under low heat, melt butter with garlic until golden. Add white wine and tomato. Simmer 4-5 minutes. Add cream and cheese. Stir until melted. Turn off heat and stir in the macaroni until blended. Grease a casserole dish with the olive oil and transfer the mixture from the pot to the casserole dish. Top the mixture with bread crumbs and more grated mimolette. Bake for 30 minutes. Visit Cheeses of France Facebook page for more recipes!